Nikki Beach celebrated its 8th Anniversary in Cabo San Lucas with great success and a new attendance record. Considered as ME Cabo’s most awaited and spectacular event, the famed Nikki Beach celebrated its 8th Anniversary of the brand’s arrival to Cabo San Lucas with great success, and like every year, it surpassed all expectations, setting a new attendance record. On friday, May 24th, the annually celebrated White Party attracted Mexican and International Media, Jetsetters and major celebrities like cindy Crawford, Rande Gerber, famous mexican actor Kuno Becker, NBA & NFL stars among many others who, along with local clients attended the party wearing exclusively white. Entertainment was performed by International Artists, such as Strings Saga (an electric string quartet with a lead singer) along with the best Nikki Beach resident DJs, MCs and Nikki-style performances, a giant LED screen, a light-men show and an amazing firework exhibition at midnight. The moon illuminated a spectacular view to the Finisterra Arch under a starry sky. The celebration will undoubtedly be remembered by those who were lucky enough to experience it, and surely are waiting to repeat in 2014. 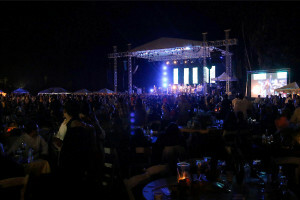 The 9th edition of Los Cabos top Culinary & Wine Fesitval had KISS as special guests and a concert by Chile’s La Ley. This first edition was well received and gathered Shops, Designers, Models, Makeup Artists and Fashion Lovers. The newest models were available for a select group who got to experience both of them in person.